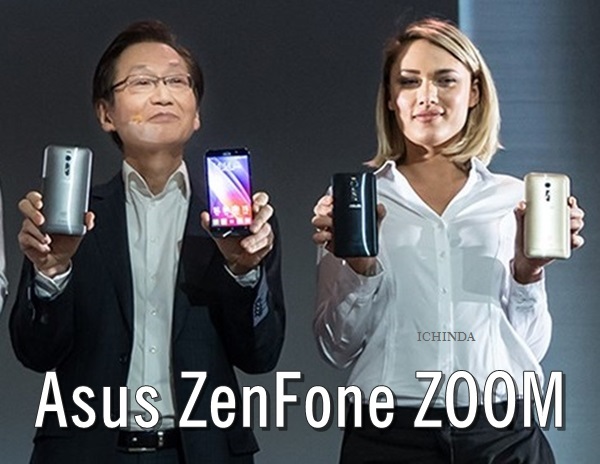 Asus ZenFone Zoom, the best mid-range smartphone with powerful 64-bit 2.3GHz, Intel Atom Z3580 quad-core processor, 128GB in-built memory and 13-camera launched at CES 2015 along with Asus ZenFone 2(at $199). ZenFone Zoom slated to go on sale in Q2 2015 priced at $399 (Approx. Rs. 25,300) in Glacier White and Meteorite Black colour option. New Asus ZenFone Zoom is just 11.95mm thick supports Dual-SIM (GSM+GSM), Micro SIM with 4G LTE (Cat. 4), 3G, GPRS/ EDGE, GPS/ A-GPS, Bluetooth, Glonass, Wi-Fi, USB OTG, and NFC comes with a 5.5-inch full-HD (1080×1920 pixels) IPS display with pixel density of 403ppi and Corning Gorilla Glass 3 delivers stunning color consistency from almost any angle perfect for watching movies, playing games and reading e-books. Asus ZenFone Zoom runs on Asus ZenUI based on Google’s Android 5.0 Lollipop and powered by a 64-bit 2.3GHz, Intel Atom Z3580 quad-core processor with 2GB RAM variant and 128GB in-built memory built-in-storage with ASUS WebStorage 5GB (lifetime) makes multitasking a fun, gives immersive game environments and reducing power usage and heat. Asus ZenFone Zoom combines dual-powerful camera for shooting which includes a 13-MP rear camera with f/2.7 to 4.8-aperture, 10-element lenses with 3X optical zoom, OIS (optical image stabilisation), laser auto-focus and dual-color Real Tone flash and 5-MP front facing camera for clicking selfies and making video call. It also includes a 3000mAh battery with fast-charging technology allows you charge your smartphone up to 60 percent in just 39 minutes measures 158.90 x 78.84 x 11.95 and weight 185 gm. Price in India $399 (Approx. Rs. 25,300). At last few honest word, Asus ZenFone Zoom is coming to replace your camera. What you think? Please be open to give your view.